Chris and I headed to scope some ponds we've been interested in fishing today. Showed up, Chris throwing fly rod, I was throwing Unfair Lures Mullet. Chris right away hooks up. The fish takes line and then up comes a big bass! His personal best on fly around 6 pounds. We work a little further and to our surprise, we see a big school of tarpon rolling. Chris launches a fly at them and hooked up! The fish jumped a total of 4 times in the small pond before breaking him off on his 5wt fly rod. Now were really wondering what else could be in here, considering that was a 30-40 pound tarpon. I was casting the shore when I see the weeds move, come past it and slammed! Drag strips out and up comes a nice snook! Probably about 26 inches, pictures and released. We looked for pipes that could possibly connect it to the river, but couldn't find any. Tasted the water and it was completely fresh. Go down a little further and Chris pops a snook about the same size! Not what you expect in a freshwater pond, but I'm not complaining. They slammed the Unfair Lures Mullet(copper back). Winds are blowing out of the East at 10 mph this morning and there is a moderate chop on the water. Small craft should exercise caution. If you plan on going offshore this weekend, be sure to check the coastal forecast before venturing out, we may see rough conditions. We have some good news this morning. Yesterday the bite picked up! Black Drum came over the rails of the north jetty in pretty good numbers, in comparison to the last month. Most were landed on the incoming tide between 7:00 and 10:00 a.m. on live or dead shrimp. Some anglers were free-lining and some were using 1/2 oz. - 3 oz. weights. Mike Ricciardi of Vero Beach was out on the north jetty yesterday and reported that 3 or 4 Snook were landed, but only one was in the slot; exactly 32", brought in by Charlie Bosco of Melbourne Beach. Several Sheepshead and a couple of nice Pompano were landed as well. Mike didn't see any Reds landed during his time on the north jetty, but we've heard that some large Reds are being landed in the evening hours. Our first photo features Mike Sullo of Merritt Island who landed his huge Red using a large pogy, off the north jetty. Mike didn't measure this big guy, but he estimated it to be around 46". Mike released the Red unharmed right after the photo. Our next photo is of Charlie Bosco with his 32" Snook and Tony Swiderski with the largest of 4 Black Drum he landed yesterday. The trout and reds have been hitting live bait and artificials around the spoil islands and near the Wabasso bridge. The sheepshead bite has been outstanding around the docks and structures using live shrimp. With the sheepshead, thesnapper bite has been good but the reports we have received have stated that they are still on the smaller size. The flounder has moved in.... fish the flats, docks and spoil islands using mud minnows and D.O.A. With the cool weather.... the pompano fishing has been outstanding. 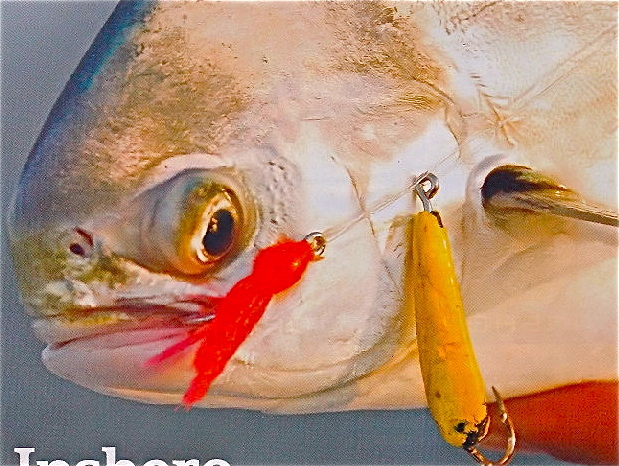 Anglers have been using pompano jigs and clams. We have also had several reports of anglers that are trolling the channel have been having great luck with the grouper. Reds, snook, black drum, pompano, flounder, blues and spanish mackerel. The blues and the spanish mackerel have been hitting on spoons. 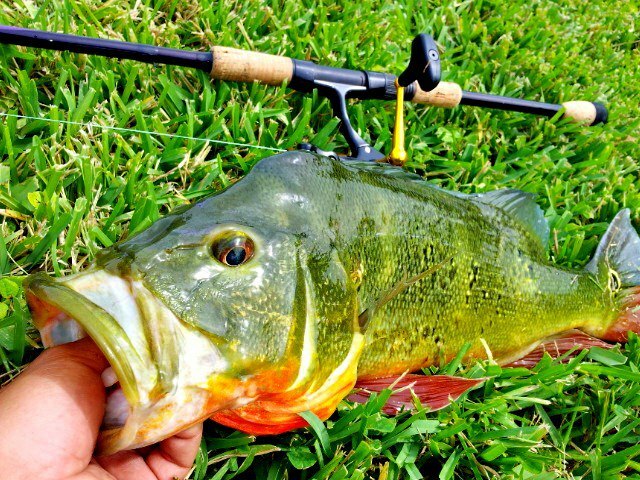 Anglers targeting pompano have been using pompano jigs, clams and live shrimp. Thereds and snook have been hitting live shrimp, finger mullet and bucktails. We always suggest using mud minnows for your best results fishing for flounder! Spanish mackerel, whiting, pompano and tarpon. We suggest using clams, shrimp and/or sand fleas for targeting the pompano and whiting. The weather has been mild, but on the windy side. It is a normal pattern for this time of year, so you must plan each trip based on what mother nature offers each day. Most mornings will be a little calmer to get out and enjoy some great fishing action. Water temperatures play an important part of fishing in winter, so you must be aware of it when you are on the water. We have had a nice mixed bag of fish lately. Trout, redfish, sheepshead and black drum have been biting around the river along with the usual jacks and ladyfish. The flats are still productive as long as the water temps stay in the mid 60's or higher. Deeper cuts along the flats, docks and mangroves will hold fish when it is cooler out there. Trout have been hanging in three to five feet of water on most flats. DOA shrimp, CAL jerk baits have been the best artificials to use on them. Live shrimp can get you sheepshead, snapper and black drum around the docks and even a few on the flats. Redfish have been under the mangroves and around the docks along the river. Lets hope the mild weather continues and warms up the water. Jacks and mackerel have been around the inlet on the incoming tides. Snook have been around the bridges, jetties and docks of the inlet. Night fishing has been best with the full moon. It's been a nice week! December is already here and where has this year gone to again... Time passes by way to quickly. December will be another good fishing month, especially if things continue on the mild side. Continue to monitor the water temperatures and move around to find clean, warmer water for your best opportunities. The wind is blowing out of the North-Northeast at 15 mph and gusting to 21 this morning. The forecast is calling for the same kind of conditions over the next couple of days. The water is choppy and small craft should exercise caution. Always check the coastal forecast prior to going offshore. The Redfish in the photo was brought in by inlet regular Diane Buyce of Melbourne. This big Red wasn't even removed from the net, she knew was way over the slot, so she just lowered it back into the water. Winds have picked up a little from yesterday. This morning the wind is blowing out of the North at 12 mph and there is a moderate chop on the water. Winds are forecasted to pick up a little more this afternoon, but it is gorgeous at the inlet this morning! We received an update from north jetty regular Mike Ricciardi, who fished yesterday morning from 6:30 - 11:30 and reported five hours of slow fishing for most anglers on the jetty. Two Black Drum came over the rails before 7:30 a.m. One slot Snook was landed by Mike White of Sebastian while free-lining live shrimp on the inlet side, but that was it for Snook. Two Reds were landed; 19" and Mike landed one that was 25", also free-lining live shrimp. Mike landed the only slot sized Sheepshead using dead shrimp. A couple of Whiting, one slot Pompano along with a bunch of undersized, and lots of small Jacks. Our first photo today features Mike White of Sebastian with a nice, fat, 32" Snook he landed yesterday. Beautiful catch Mike! Our next photo is of Mike Ricciardi of Vero Beach with his 25" Red and Sheepshead he landed yesterday. Nice going Mike! We have another gorgeous morning at the inlet. A change of wind direction and calmer water could mean a change in fishing action, we hope. Winds are blowing out of the South-Southeast at 3 mph this morning and the water is calm. North jetty regular Mike Ricciardi fished yesterday morning from 6:45 - 11:00 and reported one large Black Drum that came over the rails early and about 45 minutes later, 2 more Black Drum were landed, all were fairly large in the 24" - 27" range. Between 7:30 - 8:00, quite a few smaller Whiting were landed, a lot of undersized Pompano and two keeper Pomps were landed. Small Jacks were in play, one 16" C/R Red was landed and a few Blues in the 10" - 15" range. One angler was fishing from the beach on the north side who landed a 35" C/R Snook using clams! Anything can happen at the inlet. Our first photo today features Rob Moore of Orlando. Rob fished the south side of the inlet and reported the Flounder were moving slowly, we need more cold water to get them moving. Rob reported five keeper Flounder landed, he nailed three of them, the largest pictured in photo one at 5.5 lbs. It looks like a nice dinner to us! Photo two features an identified angler fishing the rocks of the south jetty. He had something on the line, but we couldn't tell what it was from the north side! "Capt. Joe at West Marine in Stuart Florida." "Come see Capt. Joe at West Marine in Stuart Florida." We have a beautiful morning at the Sebastian Inlet. Winds are blowing out of the North at 8 mph and there is a light chop on the water, that's a huge change from the past two weeks. Unfortunately, over the weekend conditions weren't that favorable for fishing or boating. We were dealing with high winds and choppy conditions which made getting a line out and keeping it there, difficult. It looks as if we will have great conditions, at least for the next three days. Tommy Turowski at the Sebastian Inlet Bait and Tackle Shop reported that even with poor conditions, Sheepshead were biting, along with a few Reds, Snook, Flounder, Black Drum and Whiting. Our first photo today was sent in by Justin Robinson. Justin and his son Garin fished the inlet, 25", 8 lb. Flounder. We can see on the boat there's another smaller Flounder, a Sheepshead and other fish that we can't identify, it looked like successful day. The trout and reds have been hitting mullet and artificials early AM and late afternoon. The flounder have been on the smaller size but most anglers fishing with live mud minnows and finger mullet have been having the most luck. Thesnapper bite has been outstanding around the docks and the Wabasso bridge. Anglers have been having tons of fun around the docks catching drum andsheepshead. Use live shrimp. Snook, tarpon and redfish on live bait, bucktail jigs and lures. Good reports of some nice size flounder, use mullet and/or mudminnows. 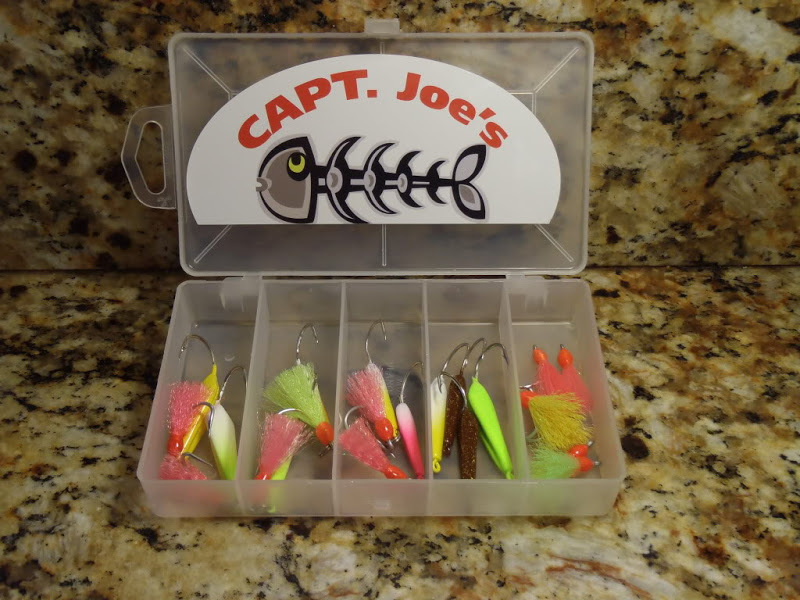 If you are an artificial angler, stop by and pick up some of our flounder pounder jigs. Pompano on clams, shrimp and Doc's goofy jigs. In addition, great action with the spanish mackerel, jacks and blues. Great action with the tarpon, pompano, spanish mackerel and whiting this past week. This morning winds are blowing out of the North-Northwest at 12 mph and gusting to 17. There is a small craft advisory through Thursday evening, but from looking at the extended NOAA forecast, it looks as if the long weekend will hold the same kind of conditions. Always check the coastal forecast prior to venturing offshore. We don't have a lot of folks out fishing the jetties this morning. Yesterday, according to Walton Ray at the Sebastian Inlet Bait and Tackle Shop, quite a few slot Reds came over the rails of the north jetty; along with a few good sized Sheepshead. Flounder are in the inlet, and we are seeing an occasional doormat. Our first photo today features Rob Moore of Orlando. 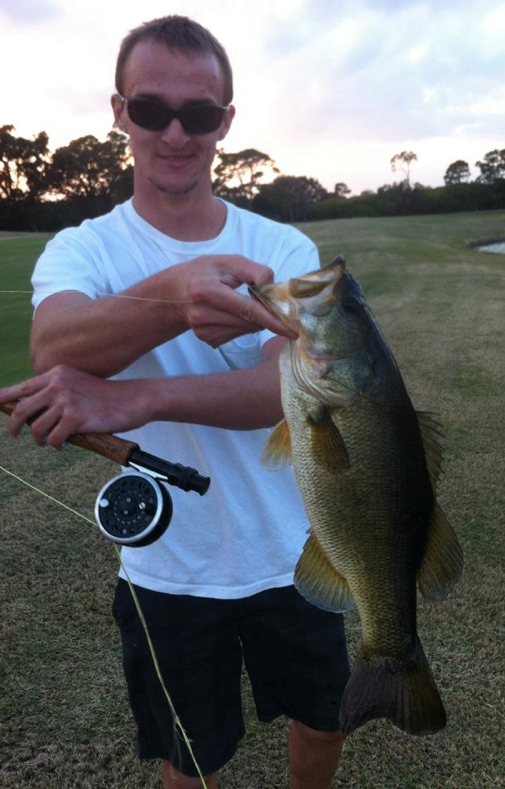 Rob fished the south side of the inlet when he landed his six lb. Flounder, along with a few other smaller but keeper sized Flounder. Rob reported the winds and heavy currents made fishing a little tough, but he was happy with his catches. He plans on making it back to the inlet over the coming weekend. This morning, winds are blowing out of the North-Northwest at 14 mph and gusting to 22. Everyone out on the jetties looks prepared, as all are wearing some type of rain gear. We received an update from SISP Ranger Ed Perry this morning who reported Flounder fishermen lining the rocks of the inlet this morning. Yesterday, a few nice fish were caught on the afternoon tide change. Ranger Ed reported that Sunday was a very good day, hopefully over the Thanksgiving weekend; we will see some good action. 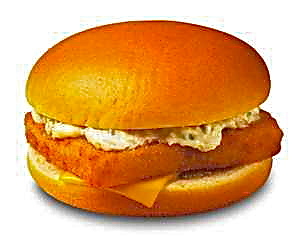 Our first photo features Steve the "Flounder Pounder". Susan Crush-Russell of New Hampshire just happened to be in the right spot on the south jetty, at the right time, when Steve brought in this approximately 40 lb. Redfish. The Red was released unharmed after the photo. Our second photo today features Andrew Etan of Palm Bay. Andrew landed these Black Drum using clams and shrimp late, afternoon. Good morning, Its sounds like the fishing is starting to fire off. Night time snook fishing, beach pompanos, and assortment of species abound. An angler reported around the south bridge there was some great fishing, catching nine snook all over the slot. Despite not taking one home for dinner they had a great time. The hot bait was a red tail hawk. This weather has made the surf fishing tough but the few brave souls that have toughed it out have caught some nice pompano and whiting. Sand fleas being the choice bait. it seems have seen the most action. Big Blues and Macs in the mix, a few Flounder were on the catch list and yes a few Snook. Then there are the bridges, the one hot spot with a catch list to long to copy, every thing from Drum to Mac’s with a good bite of big Pompano. Pompano have been in and out but it seems they are spend a little more time at the bridge, lots of those Jigging Spoons are going out the door, yellow with a pink teaser or pink have been the colors. The web cam is not out of focus, the web cam is covered with salt from the high winds. Believe it or not, the camera lens was cleaned on Saturday. We will have somebody go out and clean it again this morning, but there is no guarantee how long it will last! Winds are blowing out of the North-Northwest at 9 mph and gusting to 13. Waves continue to break over the jetties and through the north jetty grates; rain gear is advised if you head to the inlet today. The wind and waves wreaked havoc on our jetty anglers this weekend. Tommy Turowski of the Sebastian Inlet Bait and Tackle Shop reported that getting a line out proved difficult, but anglers who managed, landed a few Black Drum, Jacks, Blues and Ladyfish. From the rocks and the seawall, anglers seemed to do a little better, with Flounder, Spanish Mackerel and Spotted Sea Trout. Mike Ricciardi of Vero Beach fished the north jetty Friday morning and reported miserable conditions. Waves were crashing over the jetty and through the grates of the north jetty, soaking anglers to the bone. In spite of the poor conditions for anglers, three slot Snook came over the rails, landed by Dave Lectric of Sebastian, Mike Misserville and Mike White. Mike reported fast currents and lots of grass in the water on the ocean side, tangling lines on the way out. 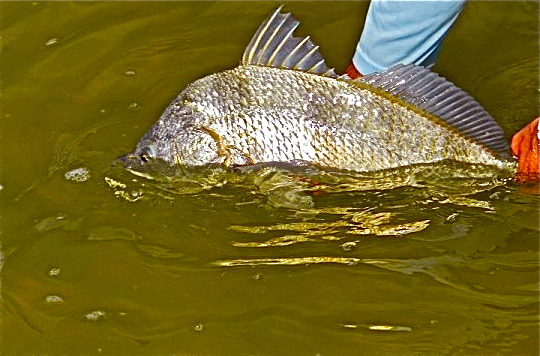 A few Sheepshead were landed on the inlet side and a lot of Ladyfish tormented the Snook anglers. One good sized Black Drum was hooked up, but spit the hook at the last minute. Our first photo features Dave Lectric of Sebastian with a 31" Snook and Mike Misserville with a 32" Snook they landed on Friday, freelining live shrimp on the inlet side. Our second photo shows waves crashing through the north jetty grates, at the temporary end on Friday. we understand that the weekend conditions were worse! Photo three shows a wave crashing over the north jetty rails, down by the web cam. Enough said! With the winds this past week, a lot of anglers have been dock fishing.... having great luck with thesheepshead, drum, snook and a few mangrove snapper. With the winds, the cold weather has really made the bite red hot. The Redfish and trout bite has been good at daylight and early evening. Use live shrimp or a D.O.A shad and fish the mangroves by Wabasso and around the spoil islands. Reports of anglers have great luck with the flounder just South of the Inlet boat ramp. The jacks are still hitting anything you put in front of them and pretty much at anytime of the day. Jacks, ladyfish, blues, spanish mackerel, mangrove snapper, black drum, tarpon, snook and oversized reds. I have heard many reports of slot and over sized snook and reds being caught on bucktails, mullet, pinfish and large shrimp. Great action with the tarpon, pompano, blues and spanish mackerel this past week. Wonderful fall weather and lots of sunshine has turned on the bite around the Treasure Coast this week. Water temperatures have been running around 70 degrees in the river and that has given us a good bite around the area. 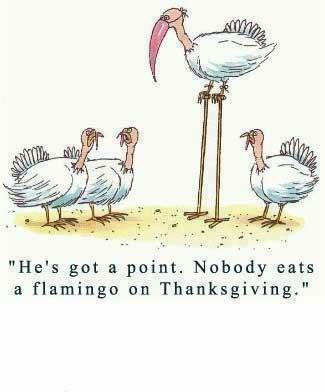 Expect more of this nice weather the rest of November and have some fun out there fishing! The trout bite turned on most of the week as the water temps continued to rise. As the winds let up, the sun warmed up the water quickly. Fall is a different fishing pattern from the rest of the year, so plan on changing tactics on any given day as weather conditions change things around. We had been fishing south of Fort Pierce with good success, but have switched to the north of the area for our fishing in recent days. Water temperature has a big effect on fishing each day and will dictate where the best place might be. We are catching our trout in three to six feet of water on DOA glow shrimp, CAL jerk baits and live bait this week. Concentrate on sand holes and drop offs during the incoming tides for your best results. The incoming tide has been our best bite and it may only last and hour. 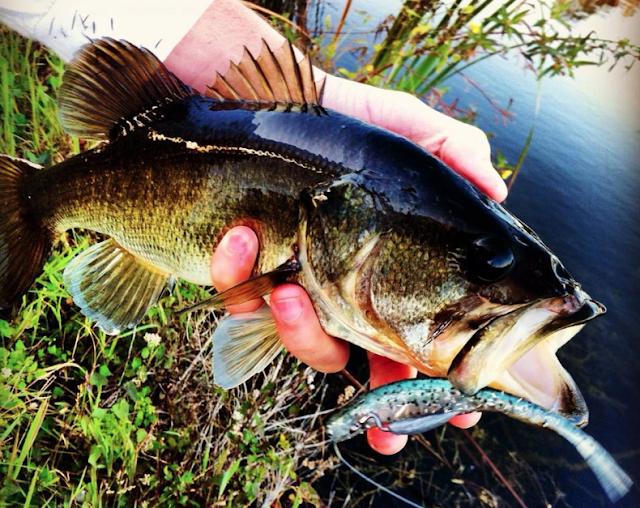 Work your lures with the tides where it will drift from the shallow areas to the drop off or sand hole. The fish love to sit and let the tide do the work for them. 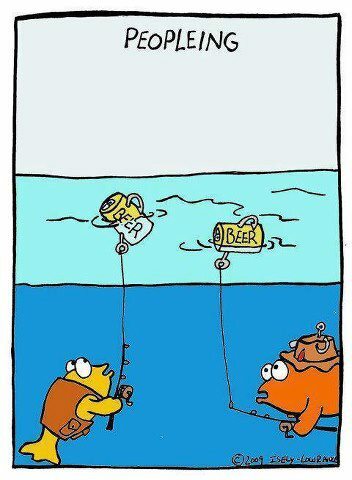 Fish are somewhat lazy most of the time. Cooler water can make them less likely to move very fast towards food sources. There are sheephead, black drum and pompano around the river. We have been catching sheephead and black drum on the open flats lately. You can certainly expect them to be around the bridges, channel edges and docks of the river this time of year. Pompano have been just south of the Fort Pierce bridges in the tidal cuts along the channel this past week. Expect them to move around the river and watch for them to skip when you happen up on some. The surf should be holding whiting, pompano and bluefish when the winds allow you to fish it. 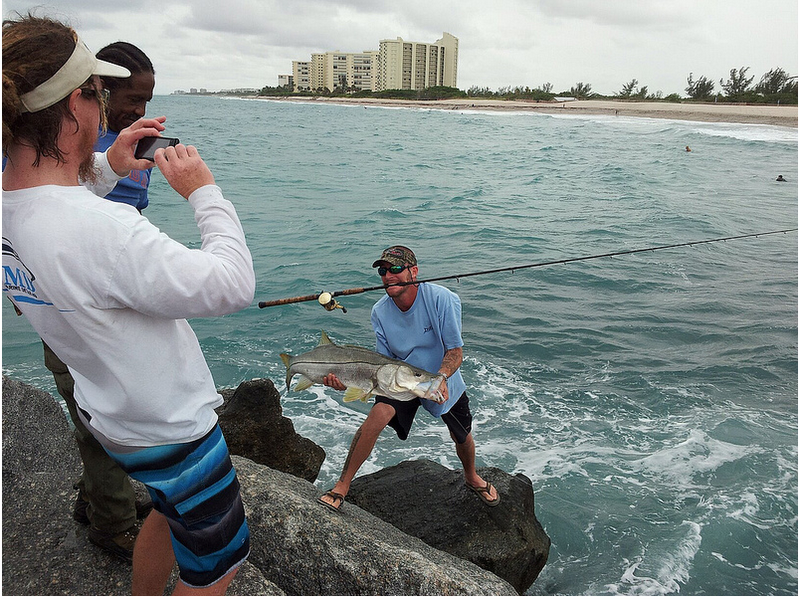 The Fort Pierce inlet is overrun with jacks, mackerel and bluefish each day on the incoming tide. Ladyfish and jacks are anywhere and everywhere this time of year! Great action for the kids! The Treasure Coast Casters will hold their November Fishing Tournament this Sunday, November 18th at Jaycee Park. Check out www.treasurecoastcasters.com if you have kids or would like to volunteer. It's a great organization. We've had similar conditions all week; high winds, choppy waters and extreme tides that have been keeping only but the true die-hards at home. This morning, winds are blowing out of the north at 19 mph and rain gear is recommended. Fishing conditions have been less than desirable, but some anglers have had success on the north and south jetties with Black Drum, Blues, Jacks, Ladyfish and a few Reds. Flounder have been making an appearance in the inlet as well. Yesterday anglers had to deal with strong currents during the incoming high tide, according to Mike Ricciardi of Vero Beach who was out on the north jetty yesterday morning. Waves were crashing over the end of the jetty, giving anglers and good shower. Three keeper Black Drum were landed, Mike was lucky enough to land two of them at 20" and 26", using dead shrimp and clams. Around 11:00 a.m., on the tide turn, four slot Reds were landed on live and dead shrimp. Mike reported a pretty quiet morning, other than the 50 or so Catfish that came over the rails! We received a great report from Matt Badolato from Florida Today newspaper. 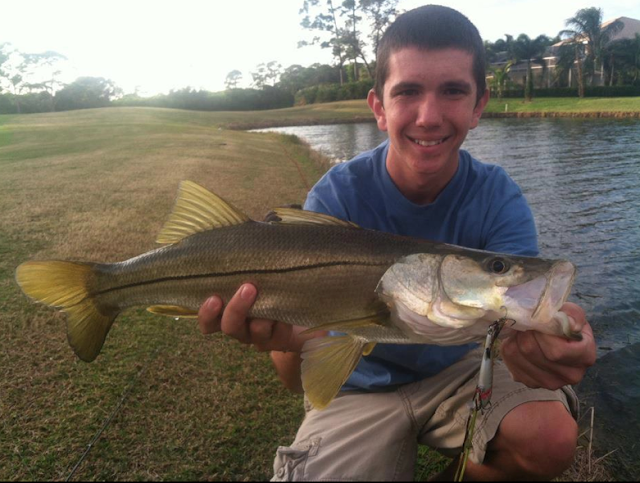 He was fishing with friend Josh Huff on Tuesday night when the guys landed two slot snook in ten minutes. They released another slot fish and two big reds during the incoming tide using live pinfish. Our first photo today features father and daughter, Adam and Gabriella Panzella of Orlando. The duo were fishing just south of the inlet using a Penn 760I spinning reel with 50 lb. braid and live mullet to land the 5' Bull Shark. The bait was picked up by the Shark within 5 minutes, but it took about an hour to get it to the beach, with the assistance of some nearby anglers. Our second photo today features Nick Galati of Orlando. Nick landed his oversized C/R Redfish using an artificial swimbait. The Red was released right after the photo. Photo three is of inlet regular Mike Ricciardi of Vero Beach with the 26" Black Drum he landed yesterday. The fishing has been good with redfish and trout to the south along the west bank north of the power lines on D.O.A grubs. The snook fishing has been good to the north and in the inlet as well. There still have been a few tarpon in the mouth of the inlet on the outgoing tide. Henry Caimotto of Snook Nook Bait and Tackle in Jensen Beach said there has been a decent run of pompano at the east relief bridges on the ends of the Jensen Beach and Stuart Causeways. Anglers have found that the moving tidal current is driving the bite. Surf's UP! There are large waves at first peak this morning. Waves are coming over the rails of the north jetty, so be sure to take rain gear if you head to the inlet today. Please use caution when casting off the north side when surfers are present. The wind has calmed down a little; it's blowing at 8 mph out of the north this morning. There is a small craft advisory for seas and around inlets. Tommy Turowski at the Sebastian Inlet Bait and Tackle Shop reported a pretty nice Flounder run going on, but the Black Drum bite has slowed down a bit. A smattering of Spanish Mackerel, Jacks, Ladyfish, Blues and Reds have been landed. Fishing with the high winds and now, big surf, presents a challenge for our jetty anglers. Our first photo features Joshua Martinez with a real pretty 26" slot Redfish he landed off the north jetty. Tony Swiderski of Sebastian is featured in our last photo today. Tony landed four Black Drum using clams. Tony braved the high winds and waves coming over the rails of the north jetty and did better than anyone on the north jetty. A couple of grates were recovered and replaced on the north jetty, opening up another 20'. At this time, approximately 80' of the jetty remains closed. The State Park has ordered the additional grates, but they do not have an estimated delivery date. We will keep you updated as we receive information from them. We have a mix of sun and clouds over the inlet this morning. Quite a few anglers are wearing rain coats on the north jetty, either for rain or waves coming over the railings. Winds are blowing out of the North at 10 mph and there is a moderate chop on the water; small craft should exercise caution. Flounder have been making appearances in the inlet; anglers fishing from the rocks and from boats anchored outside the channel have been catching medium sized fish, but not many doormats, yet. Black Drum, Blues, Jacks, Ladyfish, a few Reds and Spanish Mackerel have been in play as well. Our fist photo today features Chris Gladney of Poinciana. Chris and his buddy were fishing the north jetty when he landed his Black Drum using clams and dead shrimp. Photo two is courtesy of Mike Ricciardi of Vero Beach. Mike took the photo of 90 year old Dave Lectric of Sebastian with a 28" Black Drum he landed off the north jetty, using live shrimp. INSHORE - This is the time of year when the inshore action gets interesting on the flats. Look for trout in the deeper cuts and channels and they will be taking a live shrimp fished slow. Look for the redfish on the flats in the warmer part of the day and they will be taking cut bait. And, the channel edges will be hot with snapper, bluefish, sheepshead, blackdrum and pompano. They will all be taking live shrimp. The inshore snook bite should be good until the season closes on the 15th. Try fishing in the Ft. Pierce Inlet with a live bait on the bottom. The Inlet should also be red hot for spanish mackerel, bluefish, jacks and croakers. They will be taking both live and cut baits. Don't forget about a silver spoon too. The flounder bite should still be good over the sandy spots in the Ft. Pierce Inlet and the flast to the south of the South Bridge.